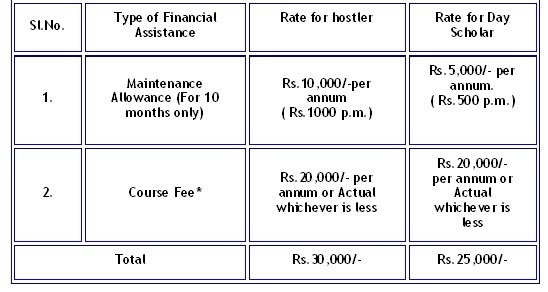 * Full course fee will be reimbursed for eligible institutions listed at Annexure-III . (a) One copy of the application for scholarship in the prescribed form (separate application forms prescribed for ‘fresh’ and renewal of scholarship by the concerned States/UTs). (c) One attested copy of certificates, diploma, degree etc. in respect of all examinations passed. (d) An income declaration by the self-employed parents/guardians, stating definite income from all sources by way of an affidavit on non-judicial stamp paper. Employed parents/guardians are required to obtain income certificate from their employer and for any additional income from other sources, they would furnish declaration by way of an affidavit on non-judicial stamp paper. (e) Proof of permanent residence. i)A receipt in acknowledgement of the scholarship in the previous year on the form attached to the application duly counter-signed by the Head of the Institution concerned, if the application was in receipt of a scholarship under this scheme in the preceding year. ii) The State department should satisfy itself that the student belongs to a particular minority community. iii) Application complete in all respects shall be submitted to the Head of the Institution, being attended or last attended by the candidates and shall be addressed to an officer specified for this purpose by the Government of State/ Union Territory to which the student belongs, in accordance with the instructions issued by them from time to time. 1. Students, who have got admission in a recognized college to pursue technical/professional courses, on the basis of a competitive examination. 2. Students, who have got admission in a recognized college to pursue technical/professional courses, without facing any competitive examination, will also be eligible for scholarship. However, such students should have not less than 50% marks at higher secondary/graduation level. Selection of these students will be done strictly of merit. 3. A scholarship holder under this scheme will not avail any other scholarship/stipend for pursuing the course. 4. The annual family income of the beneficiary/parent or guardian of the beneficiary should not exceed Rs.2.50 lakh per annum from all sources. 5. A student residing in a particular State/UT will be entitled for scholarship under the quota of that State/UT only irrespective of his place of study. Applications in the prescribed format may be submitted to the Secretary of the, deptt. of the concerned State Govt/UT administration, dealing with minority welfare, through the institutions where the students are pursuing technical/professional courses. The student must submit their applications to the state which he/she belongs to and not to the state where the institution where he/she is studying, is located.